Intercall is one of the world’s largest international conference call company. And Intercall’s own research showed that more than 60 percent of respondents admitted to doing something else while on a conference call. This “doing something else” is one of the key contributors to ineffective teleconferences. I think it is safe to say many of us would like to improve our teleconferences at work. Many of them are unfortunately either too long, not focused enough, or generally unproductive. So what can you do? I’m a terrible cook but I like to try cooking something once in a while. One thing that makes it easier is to have a clear, easy-to-follow recipe to use. This got me thinking. Why can’t we have simple recipes for business topics such as teleconferences? I know that not all teleconferences are the same, but here is my attempt at a recipe for a good starting point for a teleconference. Focus – as in not being part of the 60% who are doing something else during the call! Mix your team members, phones, and computers lightly until energized. Make sure the technology is working the way it will be needed and the team members are ready. Add coffee here if needed. Take the agenda, combine it with the moderator and use this to begin the call. Make sure the call starts on time and the moderator leads everyone through the agenda as efficiently as possible. Also, take the minute taker out of its package at this time and activate it. 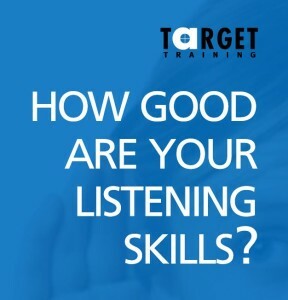 Pour in the participation, focus and listening skills from all during the call. This is important as it will give the necessary flavour needed to make your call productive. Bake this for 15-30 minutes (depending on the time given for the call). IMPORTANT: do not over-bake i.e. go over the agreed time, as this will cause a sour or bitter taste for all involved. Shake and clean the call by having the moderator summarize the key points, confirm the action items that need to be done and by whom, and schedule the next call. Let the call sit for a few hours to cool after baking. Then, have the minute taker send out the minutes to the participants, and those who could not be on the call to ensure long lasting flavour. Enjoy the tasty results of a productive teleconference! By following this recipe, hopefully your calls won’t turn out as bad as my lasagne usually does. Successful teleconferences aren’t difficult to have, but it does take a little effort by everyone to ensure consistent, productive success. Good luck with yours and happy cooking! I’m going to give you a few quick and easy tips and tricks to make your teleconferences better. Why am I going to do this? You know why. Many teleconferences are horribly ineffective and waste a lot of valuable time. I have sat through hundreds of telecons, and have trained hundreds of other people who have sat through hundreds of teleconferences. There’s a weird atmosphere on the call because there is too much silence. I can’t understand certain people when they talk. Our teleconferences are “always” a waste of time. So, if you can give me a few minutes by reading on, I will try to give you some quick and easy ways to overcome these issues. Give verbal feedback throughout the call. Simple sounds and phrases can really help the flow and atmosphere of a call. “Uh huh”, “I agree” and “Nice work Tom” are a few examples that can be used. When you go through the agenda before the call, try to have at least one thing to contribute for each point. This way, you will be prepared to break the silence and look smart at the same time! Don’t be afraid to express your opinion or give someone positive feedback. Not only does this help fill silence, but it can also build rapport (agreement) or generate some healthy discussion (disagreement). Make sure you actually say something to them about it. Many times we don’t understand someone but don’t say anything because it is easier. Politely ask them to repeat themselves. Most of the time people don’t realize they are hard to understand. Confirm understanding when you are not sure. Use phrases like “If I understand you correctly, you are saying…” and “Just to make sure I understand correctly, did you say…” This can be a more diplomatic way of telling someone they are hard to understand, and is especially helpful if you have asked them to repeat themselves a lot on a call. Contact someone personally after the call. If you are having trouble understanding someone on a consistent basis, try calling them or emailing them after a call to politely bring this to their attention. You have to be careful how you do this, but many people will appreciate knowing that they should change the way they speak so people can better understand them. Get feedback from the participants. First, assess if this is a common opinion by asking for feedback from the participants. Ask everyone what they think is causing the calls to run too long. Then, using the feedback, try to get rid of those ‘time wasters’. Make some calls optional if possible. Give people a chance to opt out of certain calls. Then they can choose to use their time the way they want. Just make sure to take clear and concise minutes so that anyone who misses a call has the important information discussed. If you usually have 30 minute calls each week, try doing the same thing in 20 minutes. If you usually have 60 minute calls, try doing them in 40 minutes. You will be surprised how much you can accomplish in less time if you focus on doing so. Remember, it is the moderator’s responsibility to keep things within the timeframe. With that said, some of the most successful teams I’ve worked with have had a designated “time watcher” that can help remind the moderator when time is running out. These suggestions can turn your sickly teleconferences into the most productive time of the week! Ok, just joking; but at least you can make them a bit better. 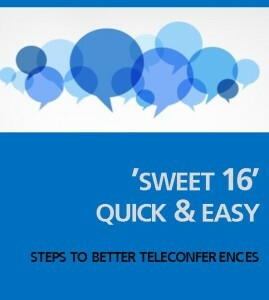 If you are interested in more ways to make your teleconference better, download our ‘Sweet sixteen – quick and easy steps to better teleconferences’. What strategies can be used to make virtual meetings as effective and engaging as possible? One of my clients recently asked me to listen in on a virtual meeting and give feedback to the chairperson of the meeting. This person wanted to make the daily meeting more interesting, interactive and motivating for the participants. Regularly scheduled meetings with topics which may or may not be completely relevant to all of the participants can lead to boredom. The temptation to multi-task and read emails, mute your microphone and tune out completely are high. Afterwards, we discussed the possibilities. Below is a summary of the ideas we came up with. Do you know which tools are available to help make your meetings interactive? There are other tools you can use apart from just sharing your desktop. If you don’t know the system which your company uses very well, find out by doing some research or asking others. Or perhaps taking formal training is the most effective way to learn more about it. It is very helpful to have some way of identifying exactly who you are speaking to about a certain point. 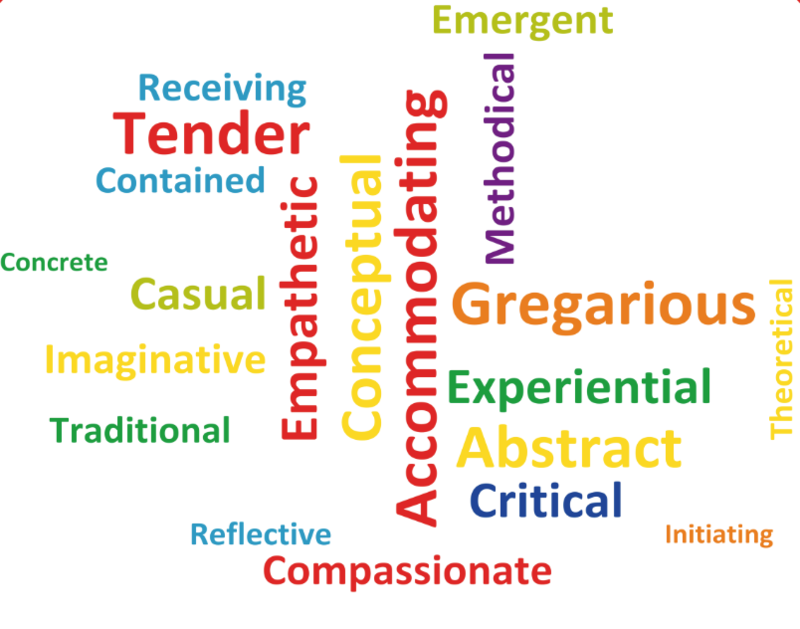 People often feel more inclined to answer or respond when they are addressed by name. Plus encouraging people is also more effective when you use their name! If possible, identify the people who need to be involved before beginning to speak. If this isn’t possible, clearly identify the topic and ask those people involved to give you some sign that they are listening. Does this mean that you want people to orally respond when spoken to? Should they raise their hands using the virtual feature? Should they do nothing? Sometimes people do nothing simply because they don’t realize that you want them to respond at a given moment. Setting expectations beforehand can make participants more willing to engage. Sometimes frequency leads to apathy. Are people starting to think that it isn’t important if they come or not or if they actively participate or not? Perhaps having fewer meetings might make them pay more attention and give the event a sense of importance again. This person could take the notes for you, prepare information, moderate chat sessions for big groups or help motivate people to respond by using pointed questions to individuals by using the chat feature. This will leave you free to concentrate on other matters. Which strategies do you use? There are certainly many other ideas which can be helpful for leading online meetings. If you would like to share, feel free to use our comments area below. Virtual meetings can be tricky at times. Are they more like a telephone call or a face-to-face meeting? Well, they are a combination of both and should be treated differently. Here are some quick and easy “Dos” and “Donts” for virtual meetings. More tips on virtual teams? These dos and donts are only a small sample of the tips in our latest Ebook: The ultimate book of Virtual Teams checklists. Make sure you download a copy if you’re interested in maximizing your virtual team’s impact. Enjoy the read and… let us know what works for your virtual team! What do you do before your virtual team meetings? Preparing for any meeting is important, especially for virtual meetings via teleconference or netmeetings. It is difficult working in virtual teams as you don’t see your other team members face-to-face very often. So, try not to put yourself at a further disadvantage by forgetting to do a few small things before your meetings. Here are five easy things you can do before your virtual team meetings to help make them more productive. List the decision makers, subject experts and opinion leaders before the meeting and identify their possible input and interests in the outcome of the meeting. Publishing an agenda should be a “must do” but it doesn’t always happen or it doesn’t happen in time for the participants to prepare. 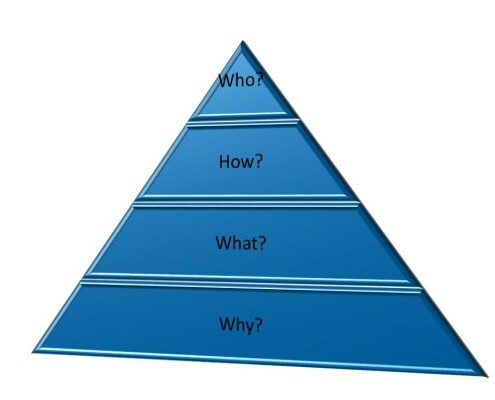 Another important feature of an agenda is a purpose statement or goal. What do you want to achieve with the meeting? What does a good meeting look like? 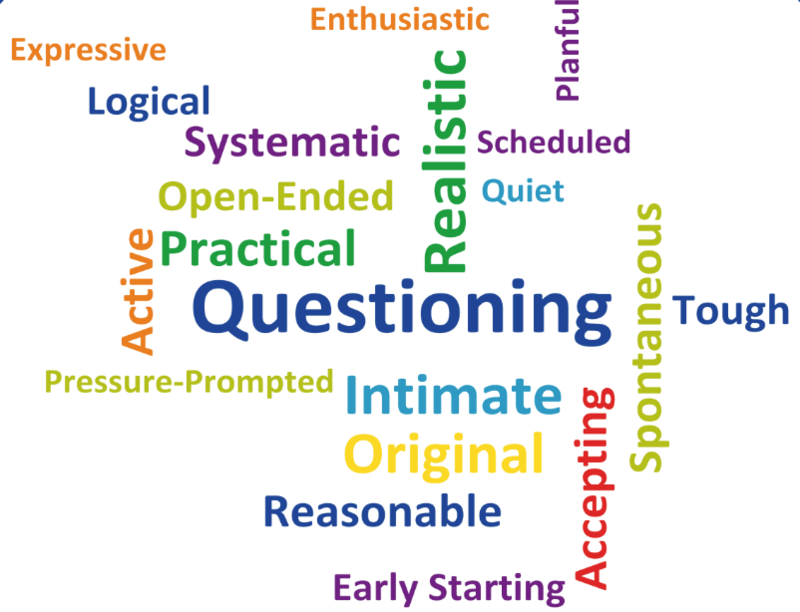 Answering these questions will help you and your participants feel like you’ve accomplished something when the meeting is over. Take time before the meeting to get to know team members personally. It’s really important to build rapport and commitment to the Virtual Team. Understanding your technological tools, what can go wrong and knowing how to fix it in advance of the meeting is crucial. Know what tools are available to your participants and be prepared to trouble shoot with participants. Always have a back-up plan. 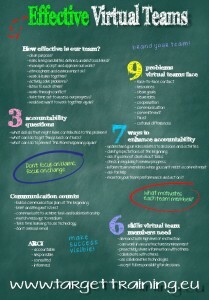 You can ensure your virtual team meetings run more smoothly by taking a few minutes and doing the five things above. What else have you done that has worked well? Let us know in the comments area below. 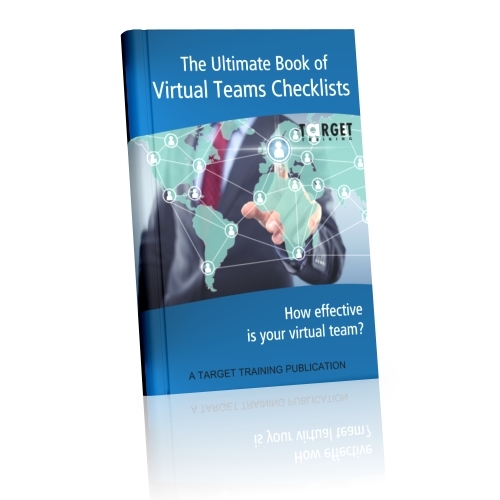 Also, if you want to improve your overall participation in virtual teams, you can download our eBook of checklists and check out our seminar on Working Effectively in Virtual Teams by clicking here.